If you rank around a five on a dog person scale of one to 10, be sure to take a travel sized package of tissues into the theater to see “A Dog’s Way Home.” If you hit an eight, prep for what can best be described as an ugly cry. There isn’t one minute of the 102 that will have you worried for the star puppy, Bella, and you know exactly how this family friendly tale is going to end, but it simply won’t matter. Of course, every second of “A Dog’s Way Home” is a manipulative trick that plays on your emotions. To make matters even worse, you know that it’s happening while it’s happening to you and unless you are fully dead inside, you cannot stop it and probably won’t want to try. That doesn’t mean you won’t notice the horrible CGI, cliched dialogue and unbelievably bland acting from all of the humans in the movie. 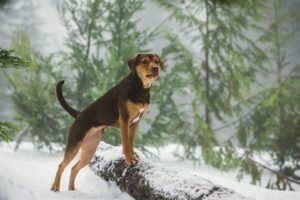 The puppy who stars as Bella (voiced by Bryce Dallas Howard) was actually a rescue dog turned “actor,” and she has miles more personality than her counterparts that have the ability to walk upright. Bella eventually comes under the care of Lucas (Jonah Hauer-King) and his mother, Terri (Ashley Judd), who is a combat veteran. An inauspicious Denver law says that pitbulls are not allowed to live inside the city limits and thusly, Bella is taken from a loving home. Everything gets off kilter when Bella attempts to run back to Lucas while she’s being relocated, unaware that she’s actually about to be reunited with Her Person. So yes, it’s a cliched family film plot at its finest. The acting, particularly from an emotionless Ashley Judd, is God Awful. There are even a few sequences so cringe worthy that it doesn’t make a difference that you’re watching an adorable dog do adorable stuff. But look … it’s about a dog trying to find home. Even though you know how and where it’s all going (spoiler alert: the dog makes it home okay), much of the journey is adorable and endearing. There are even a few moments that could legitimately traumatize some younger kiddos, especially one involving a coyote attack. If you have a dog or dogs, “A Dog’s Way Home” is going to take aim squarely at your heart and hit the bullseye. It’s impossible for this silly, forgettable family flick to not affect you in some way and should elicit several tears and perhaps even some uncomfortably loud sniffles. A person who has never had the joy of living with a dog but is aware of their existence should even think the theater is a bit too dusty.